Denise Meringolo was teaching her graduate-level Introduction to Public History course in the spring of 2015 when Freddie Gray died in police custody and city residents responded with protest, marching in the streets of Baltimore. The events of that time didn’t just make national headlines, they also sparked difficult conversations in homes, offices, community centers, and classrooms across the city about equality, representation, and safety. Knowing that history is often told through official documents and representatives, Meringolo, an associate professor of history at UMBC, felt an urgency to help the local community control and document the story of their experience, and she initiated the crowdsourced story and image collection platform BaltimoreUprising2015.org. 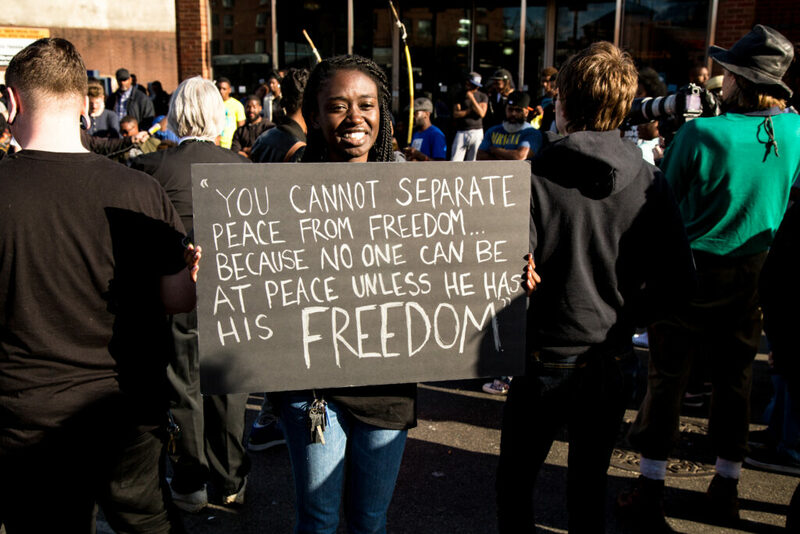 Protester holds sign during the Baltimore Uprising, 2015. Photo by Sean Scheidt (with permission). “Museums are often not very democratic places,” Meringolo notes, explaining that their collections processes and guidelines often reinforce the voices and experiences of wealthy, white people rather than broader communities in all their diversity. 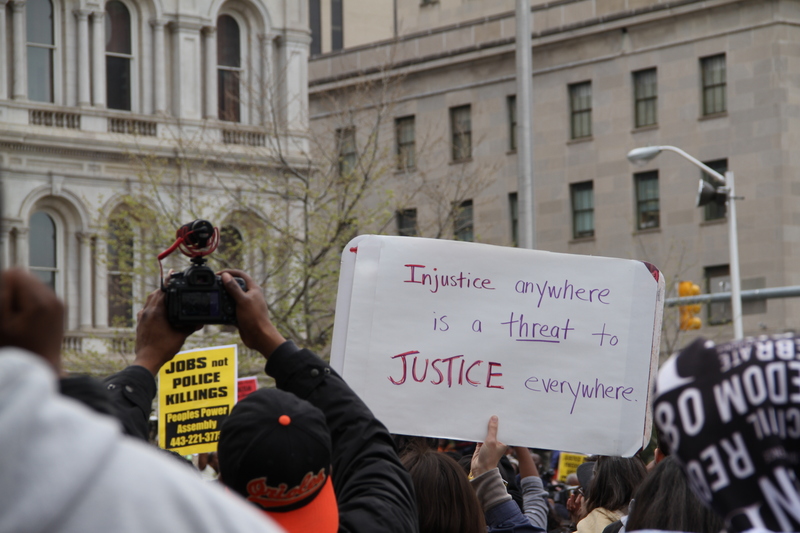 In contrast, the Baltimore Uprising digital collection puts decisions into the hands of the public. The project offers individuals the opportunity to upload their own materials and decide what they want to become part of the accessible public record. The collection, built and managed in partnership with Joe Tropea, Maryland Historical Society digital projects specialist, now includes 3,000 images, oral histories, and written accounts, and that number continues to grow. Protest signs in front of Baltimore City Hall, 2015. Photo by Jessica Baroody (with permission). Recognizing the significant potential of this work to have a lasting impact, The Whiting Foundation has awarded Meringolo a $50,000 Public Engagement Fellowship to teach historical understanding through the “Preserve the Baltimore Uprising” project. Meringolo is one of just seven scholars to receive Whiting fellowships in 2018. The recipients represent the diversity of thought and research in the humanities, from history, literature, philosophy, and anthropology to gender studies, and they engage numerous different communities across the United States, particularly groups underrepresented in the humanities. Over the next year, Meringolo will collaborate with campus and community partners in this work. As part of the Truth, Racial Healing, and Transformation Centers initiative, Frank Anderson, assistant director of the Choice Program, will lead the UMBC Shriver Center Choice education team in connecting the project with community partners and developing related youth-centered enrichment programs. Community organizer Denise Griffin Johnson and Lee Boot, director of UMBC’s the Imaging Research Center, will support the initiative in creating story circles programs to guide student scholars in formulating and answering critical questions as they develop their stories. This arts-based component of the project will use materials assembled in the digital collection with and interviews Lee Boot and visual arts graduate students filmed with student protesters after the Baltimore Uprising. Meringolo’s original collaboration with the Maryland Historical Society will expand to include oral history and interview techniques support by Joe Tropea. Thinking about conservation of the project for future community members, Lindsey Loeper, UMBC special collections archivist, will help the team develop a long-term plan to manage the digital collection. Meringolo expects to conclude her Whiting Fellowship in a way that carries through her project’s initial vision: doing collaborative public history that honors and amplifies community voices. Participating Baltimore City students will present their research at a neighborhood branch of the Enoch Pratt Free Library. Header image: Denise Meringolo. Photo by Marlayna Demond ’11 for UMBC.